Living in flat places is fine for avoiding landslides. It’s not so great if one likes to hike and climb lofty peaks. The next best situation is to have a good airport. This made it possible for me and several friends to get to Yakutat, Alaska, from which point (after a short flight) we started our climb of Mt. Logan, the highest point in Canada. 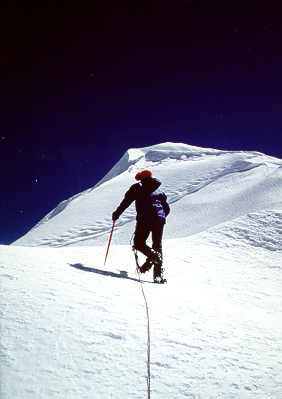 It is a sort of almost-Denali, topping out at 5,959 m (19,550 ft). It sees far fewer climbers than its somewhat higher cousin in Alaska. Having climbed Denali too, I can attest that Mt. 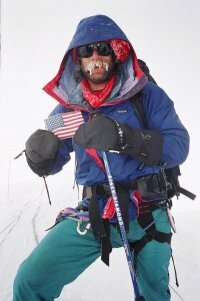 Logan’s “normal route” is a more difficult climb than its Denali equivalent. Logan gets its share of nasty weather, and the summit plateau stretches on and on. But as the phot shows, the weather is not bad all of the time. Another climbing trip took me and my friends to Kyrgyzstan’s Khan Tengri. That trip included another political scientist who climbs peaks. It was astounding to find that there was someone else in this fairly small profession who was interested in climbing. We did not reach the summit of Khan Tengri. Officially, we blame bad avalanche conditions. More honestly, it was a challenge that was above our capabilities. Or it could be that it is a mysterious and magical mountain. After all, this mountain suddenly grew the last five meters needed to bring it up to the 7,000 meter mark upon Kyrgyzstan’s declaration of independence. This photo shows how one gets to Khan Tengri—aboard the venerable Mi-8. Trips to Greenland, the Canadian Arctic and Argentina have occupied my attentions too. Then in 2004 I climbed Alaska’s Denali (Mt McKinley), the highest peak in North America at 6,194 m / 20,320 ft along with my friends, including a college roommate and some of his friends from work. We lucked out with especially good weather, so we reached the summit without any heroic effort. It was a straightforward, well planned climb. The real motivator of that venture was a friend whose job depends on very careful planning to an unusual degree. It was interesting to compare his organizational style to our research group’s field ventures. While his ventures are more reliant on technology, the need for logistical flexibility and several good Plan Bs was similar. My college roommate seems to have a seven summits bug, so he lobbied to climb Kilimanjaro (5,963 m / 19,563 ft) in 2005. We and our staff of nine—guide, a cook, porters & porters for the porters—did that, with me arriving at the summit at 3am. How could it be so cold at the equator? We will tackle some other peaks in the future with this great group of climbers. We’re planning a trip to Aconcagua in Argentina to climb that 6,962 m / 22.841 ft peak. We would prefer to climb earlier in the season, as the multitudes that swarm the place as the snows melt can turn it into a real Aconcon-kaka. Other climbs that we are eyeing include Pik Lenin on the Kyrgyz / Tajik border. Pik Karl Marx is attractive too. So is Pik Limeni Ismael Samani (a.k.a. Pik Kommunizma, a.k.a. Pik Stalin). Meanwhile, the less ambitious pursuits include Spring Break trips to Alaska for back-country skiing, and some back-country skiing in the Lower 48.